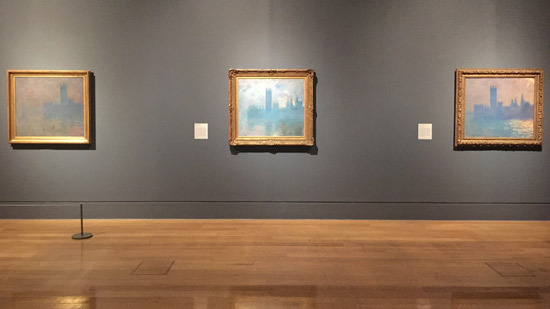 MAKING A MARK: Impressionists in London - a marketing own goal by Tate Britain! 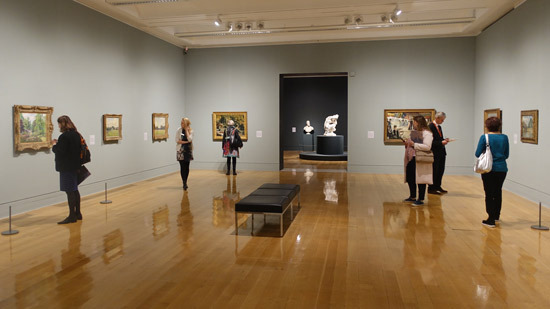 I'm going to recommend the new EY Exhibition at Tate Britain as worth seeing. HOWEVER, this comes with a MAJOR caveat which needs explaining at the beginning. It's all to do with the title of the exhibition. I wouldn't have an issue with the new exhibition at Tate Britain if the headline was "French Artists in London". 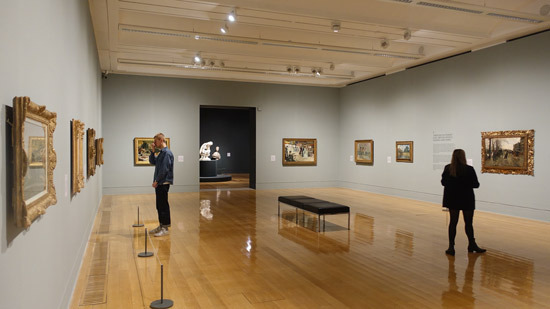 However my expectations about what I was going to see were heightened by the title they chose instead which was "Impressionists in London" - with a subtitle of "French artists in exile 1870-1904"
then my review of the exhibition. I'll not be commenting much on at least the two of the rooms as a result. So why is the title a problem and a marketing 'own goal'? Room 5, 6 and 7 contain Impressionist paintings. Three of the rooms and very substantial sections in the catalogue are given over to four artists who are NOT IMPRESSIONISTS! Room 2 is dedicated to James Tissot (1836-1902) who fought in the Franco-Prussian was and been a member of the Paris Commune and was definitely an artist in exile, However he was a painter of modern times and high society who had refused to exhibit with the Impressionists at their first exhibition in 1874. 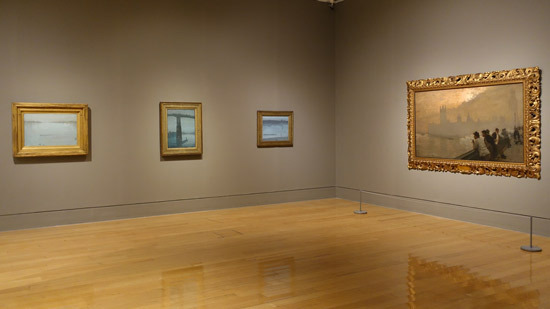 Room 3 is devoted to Alphonse LeGros (1837-1911) and Jules Dalou (1838-1902). 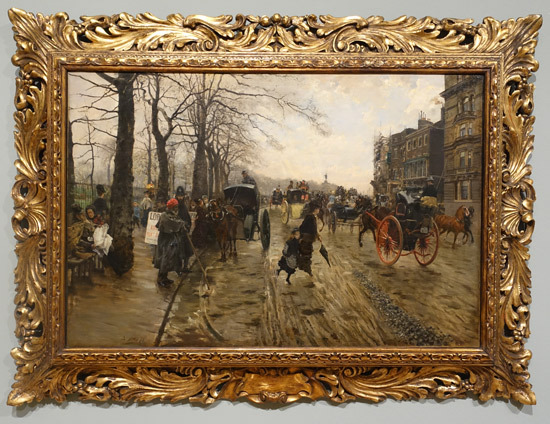 LeGros is a very boring, conservative and academic painter - who left France in 1863 (i.e. he was an immigrant not "in exile" and was naturalised British in 1888). He's a made out to be a central person for artists exiling to London following the Franci-Prussian war. In no way is he an Impressionist! Dalou may have changed the way sculpture was done but this is wholly unrelated to Impressionism. 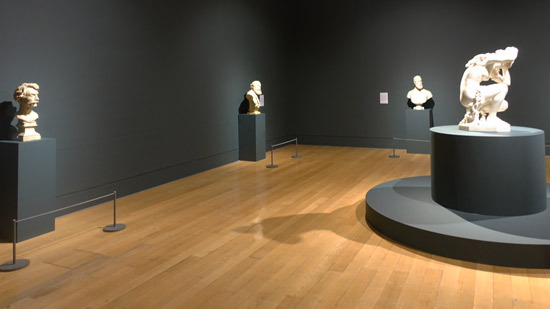 Jean-Baptiste Carpeaux (1828-1875) is a French sculptor who to my mind only deserves to be a footnote in this exhibition but instead gets an entire room (Room 4) to himself! His visits to London don't merit a mention in either his entry in the Heilbrunn Timeline of Art History or Wikipedia. He's in because he sculpted Napolean III. 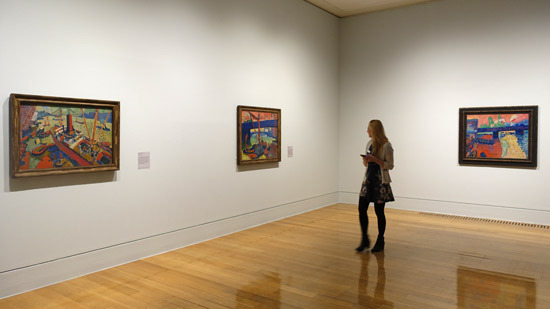 A number of the artists were certainly NOT in exile at the time they were creating paintings in the exhibition. They visited and revisited London - as painters - without any impulse or imperative to desert France! The use of the word 'exile' strictly only relates to the period 1870-1880 for the Communards and a very much shorter period for everybody else. Thus the sub-title "French artists in exile 1870-1904" actually makes no sense to me at all. There was no exile after 1880.
exile - the state of being barred from one's native country, typically for political or punitive reasons. Two of the painters are not even French and were never in exile in London! Giuseppe De Nittis (1846-1884) is an Italian painter who was never in exile and paid periodic visits to both Paris and London. However five of his paintings were included in the First Impressionist Exhibition of 1874. 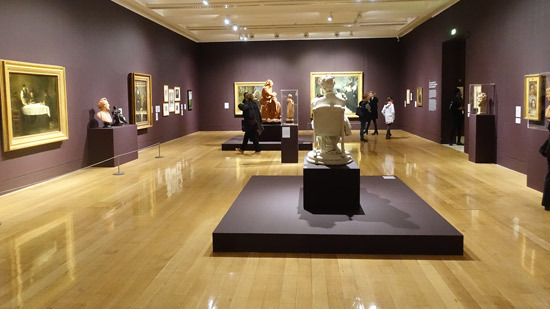 The reality is that major exhibitions these days probably need to be joint ventures and have multiple venues both to access works and defray costs. 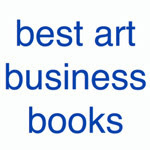 However that does not excuse sloppiness of focus in representing the exhibition to the paying customer. 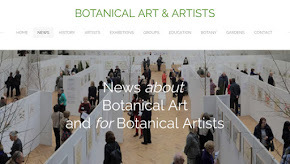 One of the information articles on the Tate website refers to Eight things to know: Impressionists in London and while informative it fails to highlight that a number of the artists were NOT IMPRESSIONISTS! When educational material becomes misleading to this extent, this is really not good enough. The title of this show isn’t just inaccurate, it’s dishonest. It’s only partly about those very bankable artists connected to Impressionism. The central principle for all marketing communications is that they should be legal, decent, honest and truthful. All marketing communications should be prepared with a sense of responsibility to consumers and society and should reflect the spirit, not merely the letter, of the Code. 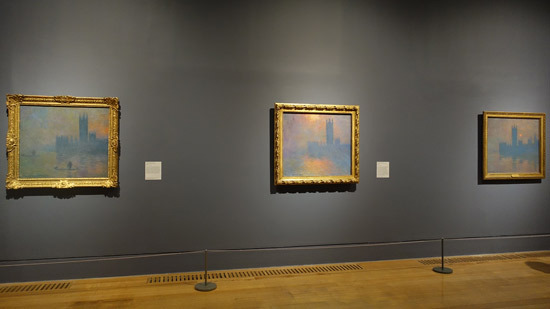 The Royal Academy puts on crowd pleasing Impressionist related exhibitions whenever they feel hard up, looks like the Tate may be doing the same. It's really not good enough. Inaccuracies have become industrial in this exhibition. That said, I'll now endeavour to highlight why it's an exhibition worth seeing. However two paintings of bridges by Monet do not entitle the curator to call this Monet's Thames Series and we're back to accuracy in terms of terminology issues. 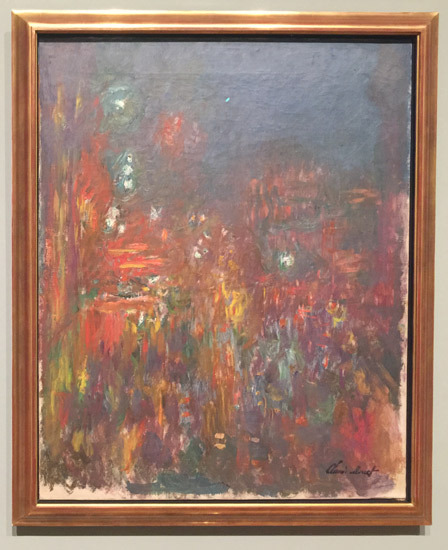 I seem to recall I saw many more paintings from the Monet's Thames Series at the Turner, Whistler, Monet exhibition in 2005 (which I happened to see in Paris during my 50th birthday celebrations). 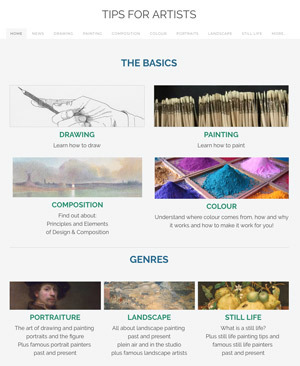 That exhibition has a particularly useful Turner Whistler Monet Teachers Pack which is still available on the Tate website. (It's such a pity more good quality educational material is not produced for this exhibition). It contains a very useful map of the locations where the three painters painted views involving the River Thames. 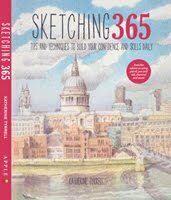 I'd have loved to see a map in the exhibition of ALL THE LOCATIONS where people painted specific places in London. That said getting six paintings of Parliament together in one gallery is amazing. It's the largest grouping of Monet's Houses of Parliament series in Europe for more than 40 years. I know some people dislike Tissot - but I like him and he was a highly acclaimed artist at the time. 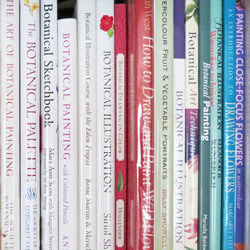 This room gives a good coverage of the work he produced and in particular his pronounced love for painting fabric. Finding out that he was the son of a successful drapery merchant makes so much more sense of the way he's in love with painting fabric. He also very plainly loves London High Society in the 1870s - and that might mean some might not rate him as a painter as a result. 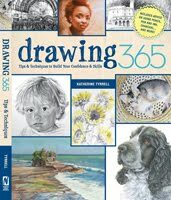 However I prefer to look at what he produced and it's very apparent he was an exquisite draughtsman - even if he also used photos to provide models for his paintings. I loved his etchings which are superb. 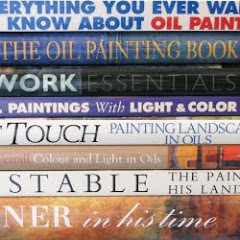 It occurred to me as I read the labels and learned more about him that he's also something of a role model in terms of "how to get on in the art world and make money"! 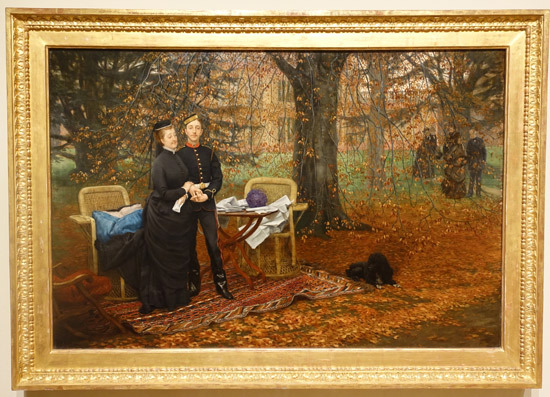 This painting by James Tissot, probably commissioned in 1874 by the Empress Eugenie, is more than a portrait of it in the company of her son: it is also and above all a moving evocation of their exile in England after the fall of the Second Empire in 1870 and their tragic destiny. The fallen sovereign is clothed in black, because she wears the mourning of Napoleon III, who died in January 1873 as a result of an operation. The imperial prince also wears a mourning armband on his junior uniform from the Woolwich Military Academy. After studying in London for a year at King's College, he joined the prestigious college of British engineer and artillery officers in 1872. Apparently the English were concerned that Tissot was mocking them - but I can't find any evidence of this but then I might be missing clues which might have been self-evident to others. 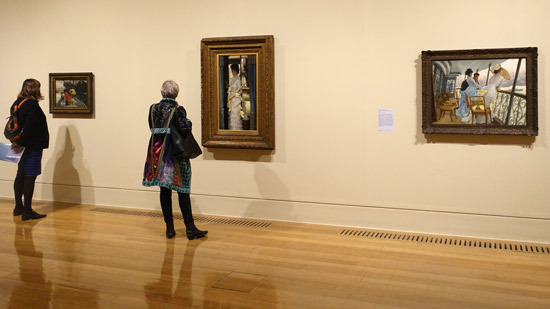 There are more stunning and large paintings by Tissot later in the show. 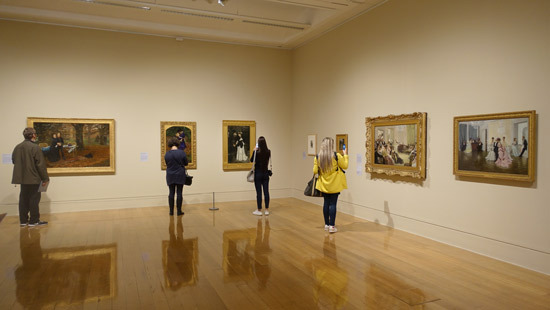 Indeed I'd venture to suggest this exhibition could have been called Tissot and his compatriots in London and it would have been a more accurate description of the show! There are paintings by other artists in this room. 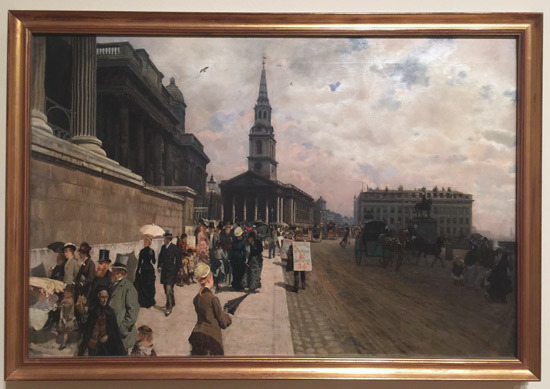 I particularly enjoyed the large painting of the National Gallery by Giuseppe de Nittis - which was one of a set of 12 views of London done as part of a commission. I suspect I like it because it's a pavement I walk along on a regular basis and it's fascinating to see how dirty the National Gallery and St Martins are. 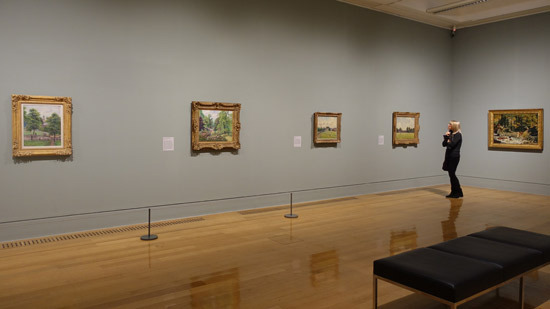 I've not got a lot to say about these and recommend you scoot straight through Rooms 3 and 4 to Room 5 if you love Impressionist paintings and that's why you came to see the show. Those who love sculpture or like to get an in-depth perspective of context in the latter part of the 19th century and/or their money's worth for the £19.70 they've paid for a ticket will want to linger longer. However I'm with Jonathan Jones - I found these two rooms to be deadly dull. 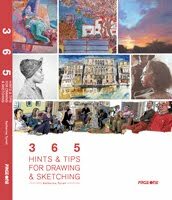 What's more they take up pages 114 - 189 in the catalogue - that's 75 pages (26% of the total) for three artists which are nothing whatsoever to do with Impressionism. In contrast to the interiors which dominate the Tissot room, this room is all about the outside and how the French painted London. It's interesting and the paintings are good - and there are yet more good paintings by Tissot included here. This is the room which is in dire need of a map to locate paintings in relation to where artists lived and the places they chose to paint. Given a lot of the visitors to the exhibition will be tourists or non-native Londoners, it's a real disservice to say where somewhere is and NOT locate it on a map. This room has three paintings by Whistler (of Chelsea and Battersea not Westminster - yet more inaccuracies and lack of a sense of location! 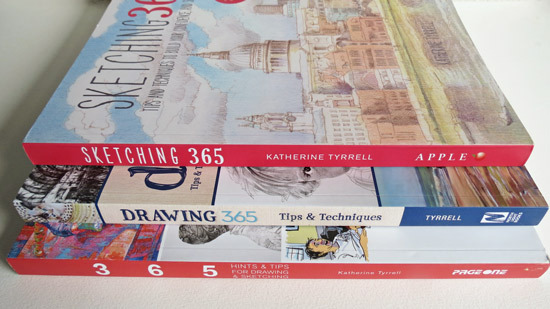 ), an absolute corker by Tissot, a painting of Westminster Bridge by Pissaro - and an absolutely whopper of a painting by De Nittis of the Houses of Parliament at Westminster in fog which is one of the best paintings of Westminster I've ever seen. - neither of whom are French! All the paintings in this room are ones which benefit from study to work out why they work - because most are masterpieces of design, composition and colour palette. I couldn't quite make sense of this final room. I'd seen two of them before but hadn't seen the painting of Charing Cross Bridge from the south side of the Thames (i.e. not the Monet perspective) which belongs to the National Gallery of Art in Washington. BUT it has some very good parts and there are some excellent paintings in the show. 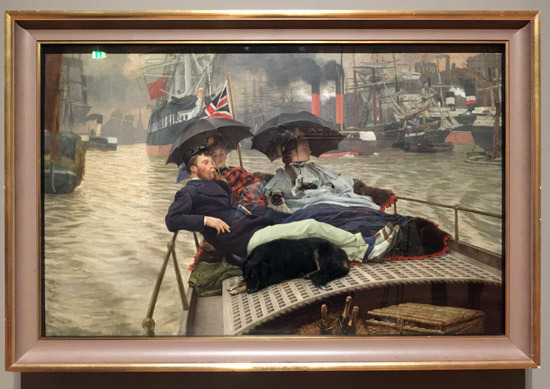 I've also rediscovered Tissot and discovered a painter whose work I've never seen before but who impresses me - Giuseppe de Nittis - who is not French, was't in exile and didn't visit London for longer periods!